I love Primitive Sheep, don't you? And you know I love Dough Ornies too. 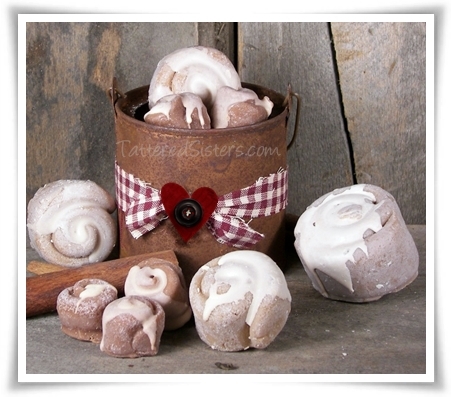 So what could be better than some Primitive Sheep Dough Ornies? I used my usual Primitive Dough Recipe to make these dough ornies. You can see some plain ones here, but I painted a couple of them to bring out the sheep in them. These would make great Primitive Bowl Fillers, along with some rosehips or pip berries, or any other kind of prim fixins. And in case you're wondering, I used a silicone mold to make these sheep--the kind that are normally used for candles/melts. 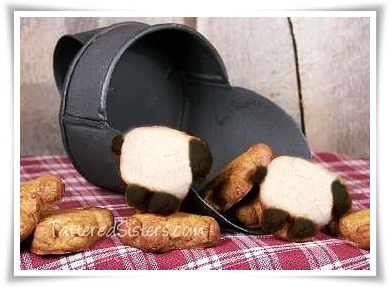 They are so great for making dough ornies! You know I love Grungy Goods, so I thought I'd make a good and grungy gift bag for February. After all, what's February with lots of hearts? And what says primitive more than grungy stuff and Pip Berries?! 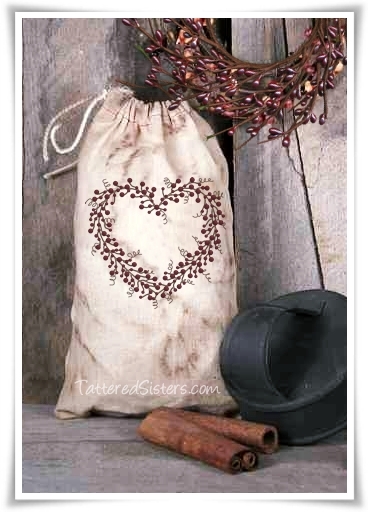 I always have a supply of grungy muslin bags on hand since I love creating craft projects with them so much. For this one all I did was use a primitive graphic to create an iron-on of the pip berries heart and then ironed it on. If you don't want to do an iron-on, you could just stamp on a heart design with a rubber stamp and ink. This couldn't be much simpler, and it would be a great primitive gift...perfect for Valentine's Day, or a party, or any small gifts. I've been in Valentines craft mode lately so I wanted to create something with Primitive Hearts that could be fun for Valentine's Day. So I came up with this Rusty Tin Bucket of Buns and Heart. I've been sidetracked lately with many things so haven't been blogging too much. But with Valentine's Day on the way I wanted to do some Primitive Freebies. 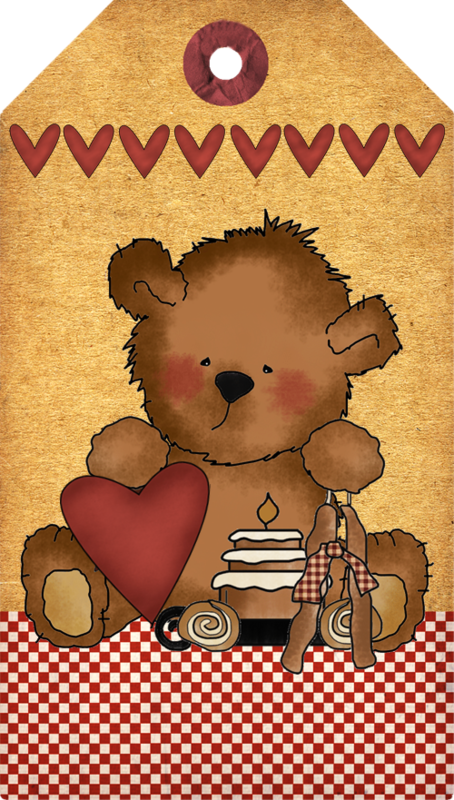 So I'm starting off with this primitive Country Heart Teddy Hangtag. Now get to crafting. You need to make some fun primitive craft or gift to put this tag on! My name is Tina, and I love all things country and primitive, and anything that allows me to tap into my creative side. Hope you'll follow Tattered Sisters and travel back with us to celebrate timeworn treasures and simpler days in the world of Primitives. Note: Some photos used here are from our primary art blog, Art Chick Studio. Those images are copyrighted to that website. Copyright 2010 - Present, Tattered Sisters * All Rights Reserved. Simple theme. Powered by Blogger.